Was wondering the same, John, but the end casing has a register where it mounts on the magneto housing, so presumably everything is concentric. Also, the points gap difference, whilst not optimal, shouldn't make that much difference as by that time the spark has long gone (it's the ramp that counts). I intend putting the ring in a chuck with degree disk & dial gauge to get some readings. Thinking further ahead, I presume these cam rings can be reground (apparently 60 deg rings are rather rare). Don't fancy doing that myself as I don't have an internal cylindrical grinder. It would need a good cam ring for me to copy on the pantograph. Don't fancy making one either for same reasons. I'd need to fabricate in the soft and then harden - after which of course it is likely to be considerably out of shape. Really needs grinding after heat treatment. 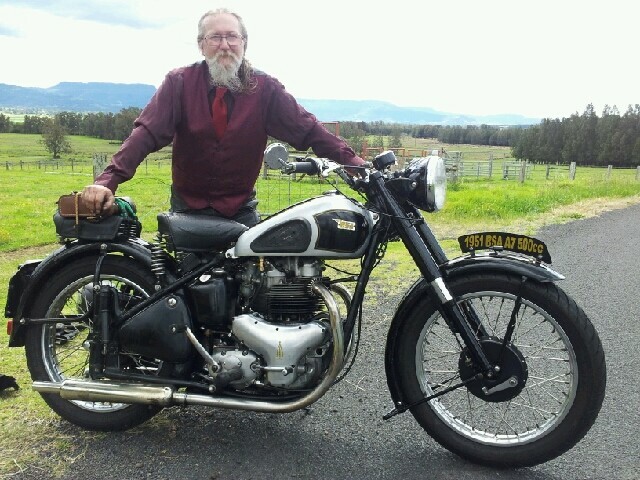 Another possible avenue is my fallback plan B. I've got a BSA? twin distributor I could modify to fit. But then I'd have to make a new cam which, however, would be a lot easier than making a cam ring. Easy to do on a pantograph from a template, or in my jig-borer with a dividing head. Only issue then would be is the rotor brass long enough to contact the 2nd terminal in the cap? Why is it that what should be simple turns out to be the most frustrating and difficult? Making the crank, timing gears, cyl barrels etc was relatively easy. Hardest part until now was making the head gaskets (couldn't get the right material). Now it seems the ignition is going to surpass the head gasket nightmare. The builder provided the sparks by fitting two sets of points and coils so its set up like two singles, one ignition cam and the points mounted to suit the firing angle. Another thought would be to modify an electronic pickup plate and run EI ??? For darn good reasons John, as RD is finding! Most of the V mags I see are 50° or 45°. 60° is at the outer limit - but it should work for all that. However, your other options may well be worth considering - and all the more so if we're talking high compression?? Some of the (much) older twin mags used two separate detachable lobes inside the ring housings. Often, the lobes can be moved to go where they are needed with a bit of measuring drilling and tapping. But the open/closed circuit ratio is often way off what is ideal (too much dwell), so probably not a good plan here. Modding a BTH would be an interesting exercise. Yes, they are very nicely made in all departments (a lot of Bosch thinking in them to be fair), but the pick-up arrangement of the KC2 is a PITA for a lot of engines. Their spark performance isn't markedly better than a K2F at low speed, but they hardly ever have firing interval trouble, their contact breakers hang together very well and you can mix and match parts in a way you wouldn't want to think about with Lucas sometimes! Probably be a serious one-off job to get a 60° ring made though . . . .
Another left-field thought would be to modify a static coil magneto like SR2 - or better, a Joe Hunt. That would be 'just' a cam job for you RD in theory, like doing a dizzy. Both can be had with flange mounts, witness SR2s on Oilfied twins and Hunts on all sorts. The Hunt red competition spec twin-spark coil is a pretty fearsome thing! They do 'em for HDs (which are I guess are all 45° but IKBA) . . . so maybe . . .???? Thanks Bill and John for well-thought out suggestions & ideas. Have been kinda sidetracked today, so intend looking at this again on Friday. Being this is a one-off engine I don’t want to get into it too much more at this stage so, whilst a BTH mag looks interesting (and should fit without too much bother) I don’t really want to go down that route until I know whether this engine is a runner. I have always run BTH on my race bikes and rarely had any issues with them. I nearly finished this engine almost two decades ago, but since then it’s just been lying on the bench. I got back to it just before Christmas, and now I’m on the (hopefully) home run. Engine is installed in frame and once I’ve modified the oil tank to clear the rear carb, found a kickstart (and got some sparks) it’ll be time for the big test. So what I’m hoping to do is improve the phasing of this mag enough (if I can) to try for a start. If all is OK, then I think the best option is to fit a distributor - my original plan B. I have a Lucas DKX2A – type RO – in very good order that I purchased a while back, thinking then that this engine (1,000cc @ 8.5:1 comp) may well prove to be a bugger to start on a magneto The distributor shouldn’t be too hard to modify, either by making a new cam or regrinding the existing one. Certainly a lot easier than a magneto cam ring. Only worry then is whether the rotor arm contact is long enough to reach cyl no 2 in the dist cap. Have finally diagnosed the points gap / timing problem. Having made some new shims because a couple of the existing ones were a bit tired - and following John’s advice - I turned the housing back to original and checked gaps / timing. It was then that I found the cam ring bore in the housing was out of true with the armature bearing. Presumably a lot of A10’s and A7’s suffer from the same issue. Not much one can do about that, except maybe open the bearing bore and fit a sleeve concentric with the cam ring. As noted in an earlier post though, my first job is to see if it’ll run. Hopefully it’ll fire on the rear cylinder and with luck the front will chime in. If everything is hunky dory, I may refurb the mag housing. If not, it’ll be a change to distributor (meaning a battery, charging system etc etc). All of which of course assumes the engine’s a good’un. Reason I chose the slightly unusual 60 degree configuration is several; I’d already done a 50 deg, I figured on a large-capacity short stroke motor room would be tight between the heads (see pic for lack of room) and lastly it gets closer to Phil Irving’s magic 76 degree. Nice work there mate. Are they XT/SR top ends? It was then that I found the cam ring bore in the housing was out of true with the armature bearing. Presumably a lot of A10’s and A7’s suffer from the same issue. Not much one can do about that, except maybe open the bearing bore and fit a sleeve concentric with the cam ring. Not uncommon RD. But always worth hoicking off the housing and reseating the bearing outer race (if it was in place when you measured the lack of concentricity). They're often a bit 'off' if the insulator isn't perfect or gunge has been used to assist retention and it's one of the first places to go when firing interval and points gap won't play ball. Wear on manual mags between camring and housing is also common. A good wheeze can be the use of self-adhesive stainless steel shim tape 'tween ring and housing to compensate for errors - it comes in a good variety of fine thicknesses and is tough stuff. New housings and rings can be had at a price but most times the bits can be got to within a degree or so, and the points gaps to close to equal. The real test is the firing interval at speed. While it's poss to get things right statically using eg a rotary table, there's no substitute for strobing the running motor obviously. What one sees at 0rpm isn't necessarily what one will see at 4000 . . . . Fantastic project - deserves to be a big success! Amazing work! What will that shaft on the right drive? Dynamo? Supercharger? Spinning sword? Musky - both. Couldn't find a pair at the time, so changed an XT head to SR spec (bigger inlet etc) & trimmed the SR fins. As the heads are no longer level, I welded appropriate weirs to the camshaft troughs to contain oil. Also, because inlets have to turn through 90 deg to reach somewhere a carb will fit, I modified the inlet ports to flanges. Barrels are my own. Greybeard - spot on - shaft on right is to drive an alternator. Groily - when I was checking concentricity I didn't look too closely at the bearing outer race, but there seemed to be a gap between it and the housing. I presumed one of those bl**dy awful serrated gaskets? Still have some somewhere, if they're the same as BTH that is. They always seemed to slip sideways when I fitted them. BTW the camring is a good fit in the housing. Only way I can think of re-aligning the bearing bore to the camring - assuming it's possible - would be to turn up a mandrel for the camring bore to sit on and then open up the bearing bore to take a sleeve. - when I was checking concentricity I didn't look too closely at the bearing outer race, but there seemed to be a gap between it and the housing. I presumed one of those bl**dy awful serrated gaskets? Still have some somewhere, if they're the same as BTH that is. They always seemed to slip sideways when I fitted them. BTW the camring is a good fit in the housing. Yup - the housing is bored to take outer race + insulator cup. Probably makes very little odds in anything other than the very long term as long the earth brush/es is/are doing their job, but most mags have the insulators for that reason. They come traditionally in 2 thicknesses, 10 and 13 thou, to allow for wear, machining variations, whatever. Dimensions to suit the various bearing sizes involved. In this case an E15. Bearings in all common mags are standard sizes, with E15 being used at the cb end on all Lucas K series (except C versions), also on the drive ends of early K series, and at both ends on almost all BTH. Same insulators therefore as what you have, almost for certain.. If your one had slipped in the fitting, or the bore has previously suffered damage for any reason, it could make a few thou difference to the concentricity. Nowt wrong with setting the thing up to overbore and sleeve if you want though - that way you'll know it's right. Sometimes it's a good mod to bore out early K bodies to get them to take the bigger 18mm drive end bearing and fatter armature shafts that arrived in the early 50s. Especially for mags carrying the weight of ATDs, where it's not all that rare to find the steel shafts are loose in the brass drive end cheek. Good news the camring's a good fit. Only other thing to maybe mess with is the points. Sometimes, fitting a new opening point with an unworn heel makes a surprising difference to things. Just had a thought. Yes, I know, dangerous and all that .... but seriously, it seems to me that rather than boring the casing for a sleeve to fit the std bearing, why not open it up to take the bigger 37mm bearing? From what I can see, the other dimensions are identical - it's just a bigger outer race. Is that correct? Good idea RD imho. It's just the od of the outer race that is different. That 15mm id 'N3048' is found on the drive end of (most) MO1s and also at the cb ends of most if not all C versions of Ks. Bit chunkier, no other changes required. Just need to get the thing well-chucked on a mandrel like you said earlier (or even using the camring housing and an independent 4 jaw for that matter - maybe).